What Am I Bid For These Treasures? As I mentioned in Friday’s post, Motor Man and I attended an auction Saturday. We learned that items from my late aunt and uncle’s estate would be included. These were my cousin, Lona’s, parents. 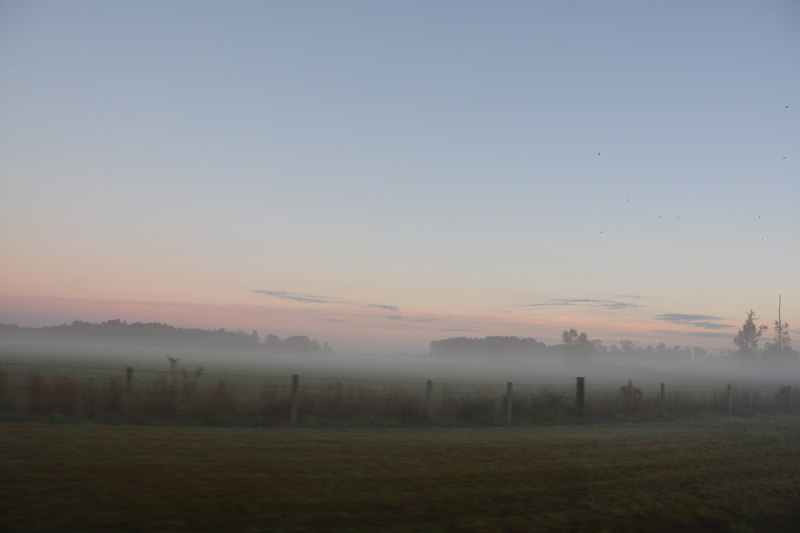 We were on our way out of town well before dawn, driving the 50+ miles to the farm where the auction was being held. If you must be up and on the road that early in the day, it helps to have a beautiful morning for a drive. One item in particular was the reason I wanted to be at this auction, and I’ll write about that soon in a future post. The day was filled with emotion and unexpected found treasures. Friends of ours (who were also friends with Lona and her parents) came to the auction, too. There were actually two auctions being held at the same time, so it was nice to have our friends keeping an eye out for items they thought we may be interested in. Although I have attended a couple of auctions, I had never actually bid on anything……until Saturday. 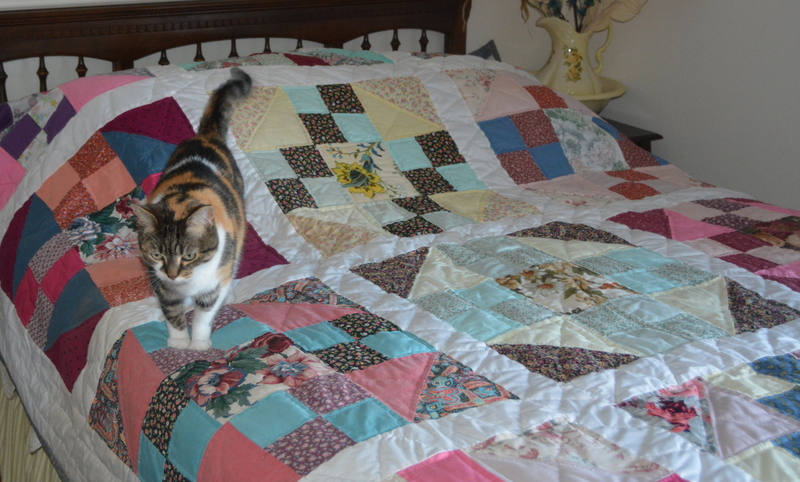 A quilt was to be first. As the bidding for the quilt began, my friend, unbelievably, noticed embroidery in the margin. When I saw the names, I knew I needed to bid on it. Bennie and Doris were Lona’s parents. Bennie was my mom’s brother, and Martha was one of their sisters. There was a showcase nearly filled with costume jewelry. 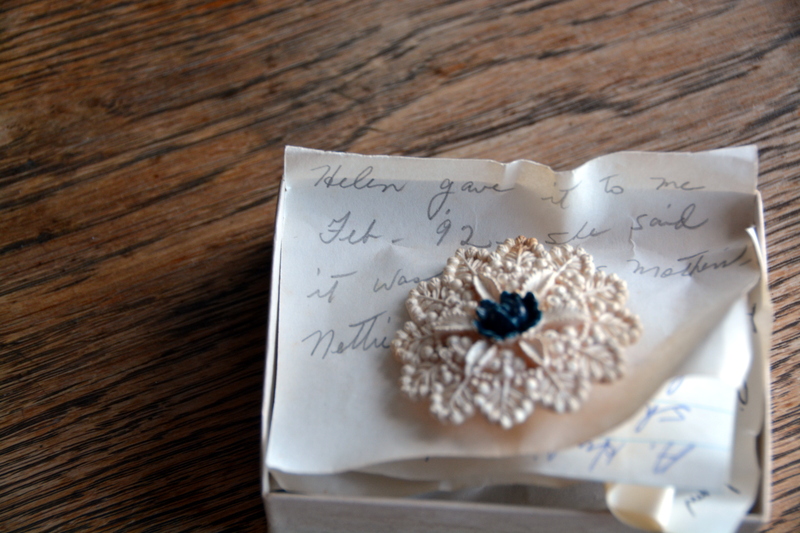 Our friend noticed a tiny box containing lapel pins attached to handwritten notes. Rather than auction the entire showcase at once (which was my fear), we were told by the auctioneer to choose whatever items we were interested in, and we could bid on those. I was the only bidder for this little box, which I didn’t really examine before buying. Inside were three pins, but I was brought to tears when I could actually read what was written on the note on top. Lona’s maternal grandmother was my dad’s sister, and Nettie McGuriman was their mother. She passed away many years before I was born. That’s Lona, as a baby, with her parents. My late sister, Rose, is sitting on the counter to the left. (Written on the back of the photo are the names and date, along with ” whose legs and feet are these?”.) 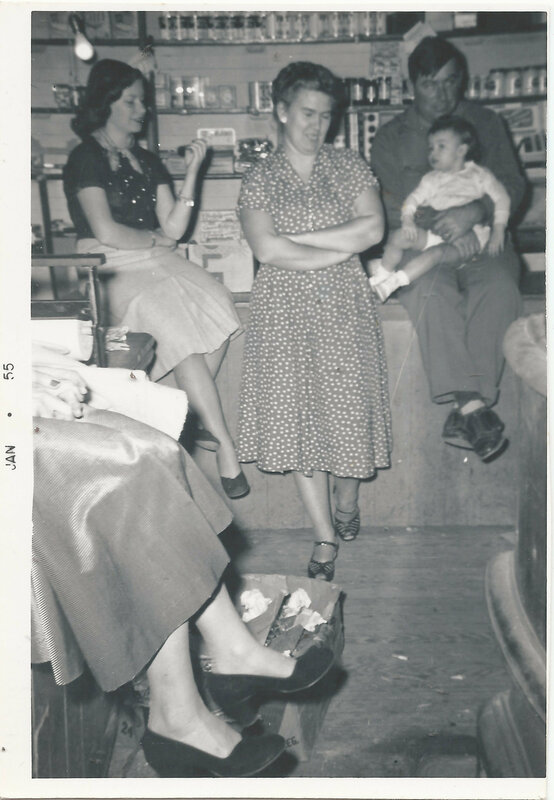 It was taken in my Grandmother’s store on Christmas Day in 1954. Beside my sister is the roll of butcher paper Grandma used to wrap hoop cheese and bologna she sold. Along with that, I also remember that old stove, barely visible, to the right. The box on the floor appears to have torn wrapping paper on top, most likely a recently opened Christmas gift. 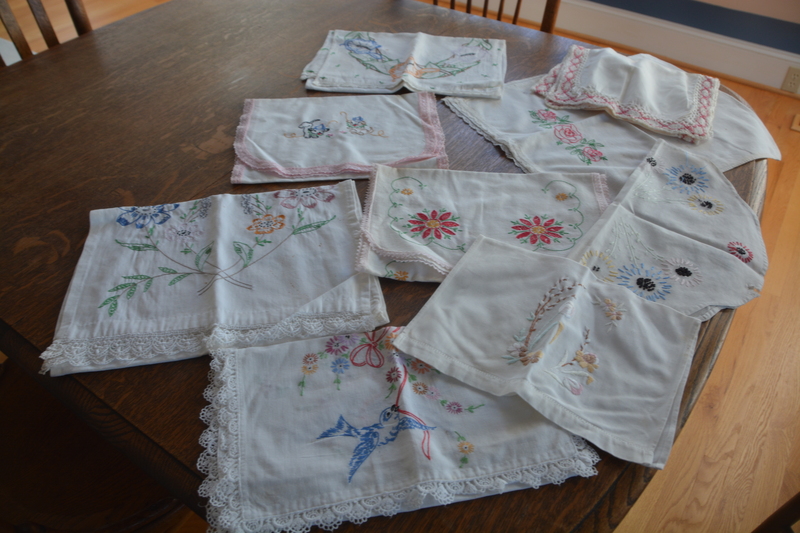 Also found, linens, most likely embroidered by Aunt Doris. 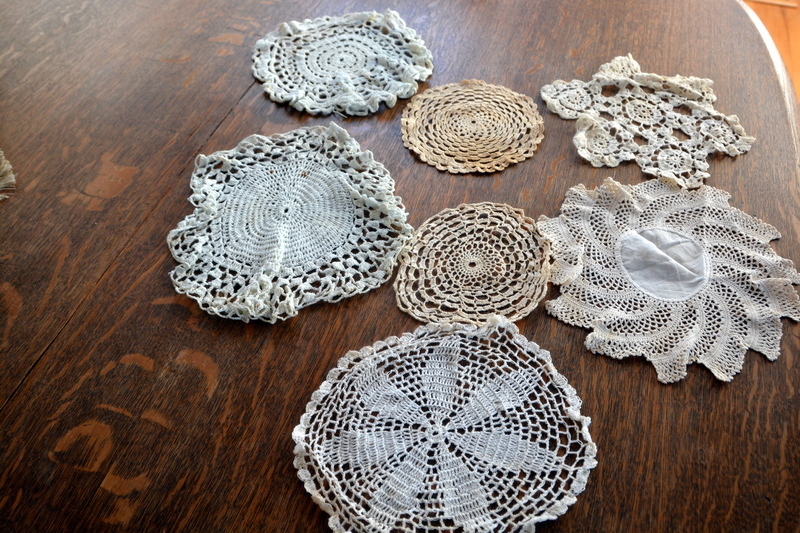 And crocheted doilies. I have to wonder if any of these might be Nettie’s handiwork? I’m so grateful to have the opportunity to keep these items in the family. And also thankful to our friends for not only getting us the information on where and when the auction would be, but also for being there with us as extra “eyes”. The two of them, and of course, my Motor Man, were my emotional support through all those tears. 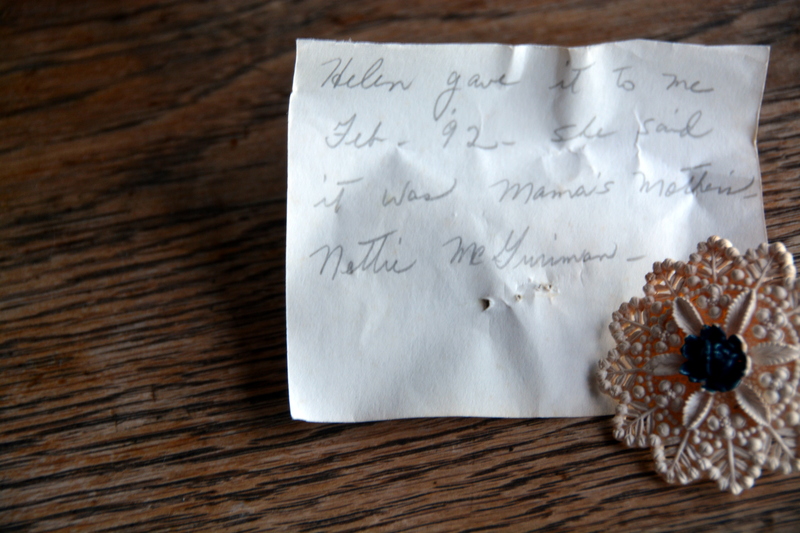 This entry was posted in Family, Traveling Days and tagged crocheted doilies, embroidered table scarves, estate auction, old family needlework, old family photos, quilt made for family members. Bookmark the permalink. Lots of family treasures “regained” from the auction – it’s great to keep them IN the family so I know you’re thrilled you got them at the auction. Well done! How lovely that you were able to save some precious family memories. I couldn’t wait to read your blog to see what treasure you had found, and omg, these items are priceless!! So happy for you – I know your heart over flowed with such happiness!! The picture is such good condition! ! I will bet you smiled the rest of the weekend. So happy for you! What wonderful treasures. 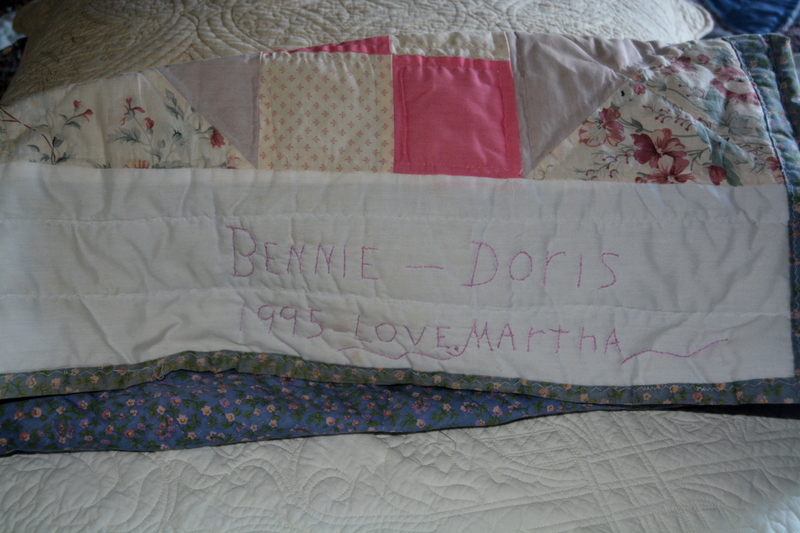 The quilt is beautiful Dianne. I love the photo from your drive! What a bitter sweet day for you. What special treasures you found. What an emotional day for you. AWESOME!!! Wonderful treasure – the pin is beautiful. So glad the picture has been found and has a kin home. You have a month of blogging with the treasures you’ve found – you’re probably still making ‘discoveries’. Glad they’re ‘back home’. Beautiful quilt, beautiful pin, beautiful pic with Rose. What an awesome day you had, my friend! I’m SO glad you were able to go, Dianna. I can’t imagine all those treasures gone for good. These treasures were meant for you and are right where they need to be. I am so happy you have them! So glad you see the true value of these items. I am so glad you were able to get these treasures. What a wonderful day this had to have been even if it was emotional. So glad you got this part of history back. Oh my goodness. I am so happy that you got to keep all those family treasures!! Reading your post just made tears come in my eyes. I remember so many things I had over the years from various ‘passed on’ relatives including my Mom. When I moved I gave most of them to my children. You are going to enjoy those things for years to come. What wonderful treasures! No doubt in my mind that you were meant to have them. I just love that there are handwritten explanations with those pins too.